In April 2016 Jim & Diane traveled south to Valdosta, Ga for the wedding of niece Liz Hudson Huddleson. 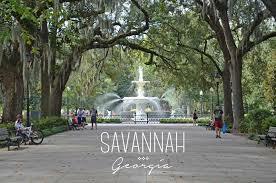 On the way down and back we stopped in Savannah, Ga. What a beautiful city it is. All of the large trees are called Live Oaks because they have leaves year round. Most of them are adorned with hanging Spanish Moss. Throughout the main part of the city, which is only about a mile square and called a walking city, there are 22 park like squares like the one above. This one is dedicated to General James Oglethorpe, who founded Savannah. This house is the birthplace of Juliette Low, founder of the Girl Scouts of America. Above is the Mercer William House where part of the movie about Savannah, Midnight in the Garden of Good & Evil, was filmed. You can tour this house as well as many others in Savannah. By the famous Fountain in Forsythe Park. Jones St, voted one of the most beautiful streets in North America. The Pirate House is a restaurant that has been welcoming guests since 1753. The little building to the right of it is the oldest house in the State of Georgia. Bonaventure Cemetery is not the oldest but certainly the most famous cemetery in Savannah, where the statue of the "Bird Girl" featured in the novel Midnight in the Garden of Good and Evil once stood. The Spanish Moss makes it look quite spooky. Catholic Cathedral St John the Baptist. The view from our room down on the Savannah River and River Street. A view from our room up the river and the bridge crossing over to South Carolina. The port of Savannah, surprisingly the fourth largest in the United States. One of the many ships we saw going up and down the river. Each one of those little boxes is a tractor-trailer. A view of our hotel from the river. I've circled the window in our room. A few shots of Tybee Island, on the Atlantic Ocean, just 15 minutes from Savannah.